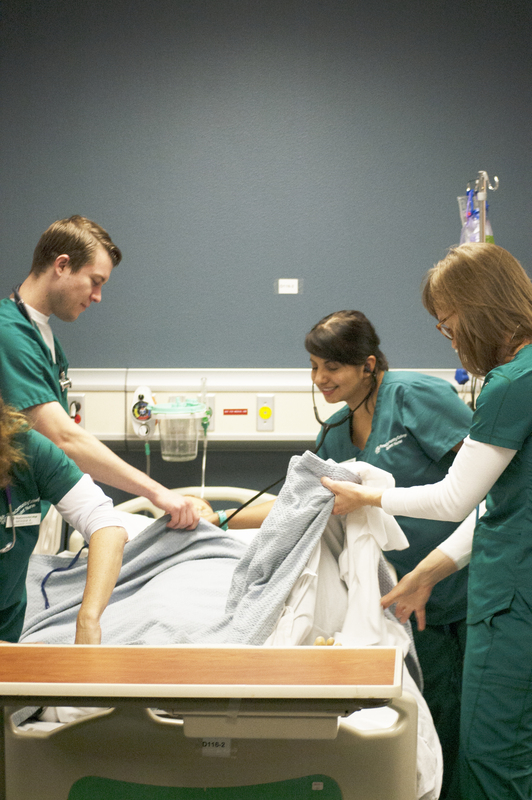 Pima Community College’s Nursing Center for development offers premier training to begin a career in the fast-growing fields of nursing and caregiving. PCC’s Nursing program has partnerships with local universities that allow for the students to have training from nurses’ assistants and eventually earn a bachelor’s degree in nursing. One of the center’s main focuses is to have transfer opportunities for high degrees and concurrent enrollment programs allowing for completion of an AAS and bachelor degree at the same time for a fraction of the cost of a more traditional pathway. Some things that are unique to the center for development are the facilities that the students are able to use and learn from. “All of the programs have additional access to the Simulation Center, located at WC in the D Building, which fully immerses the learner in a high-fidelity, high-engagement learning experience in a controlled manner,” Dore said. “This allows the students to make mistakes and learn from them without impacting public safety. This is a big adaptation from what had been present by most community colleges. This can allow students to have a unique opportunity to learn at community to study at a junior college and save money while still gain the knowledge as if they are at a university. The program also is getting new additions such as the integration of augmented reality and virtual reality to help with medical training for the future. “This includes several AR/VR labs, an enhanced simulation center, upgraded skills labs, new digital radiologic imaging equipment, upgraded respiratory ventilators, and modernized high-engagement classrooms,” Dore said. This creates a new hands-on experience for the students without any risk to public health and in a less stressful environment for them to learn clearly. Some of the programs for the Center of Excellence for health professions are selective application processes and function on competitive entry practices. Students should expect to be skilled in mathematics, biosciences and reading. “Some programs are even more tough requiring the HESI A2 assessment, volunteerism and previous work in health professions,” Dore said. “Students seeking entry into any of the health programs under the COEHP should look at the many entry-level health courses available including nursing assistant, medical assistant and phlebotomy as these are programs a student can complete quickly, with minimal expense, and be in the healthcare workforce quickly. This gives the students essential information that would, in turn, make their coursework easier. The hire rates directly out of the program are extremely high, Dore said. “Most of our programs under the COEHP designation (at this time) have close to 100 percent hire rates, some prior to the completion of the program,” he said. “PCC’s health programs are highly respected, highly sought after in the industry, and are directly aligned to the industry. “All programs under the COEHP are directly linked to an Advisory Committee that guides the development of curriculum, which in the end, creates a graduate that the employer easily can transition to their institution. This is a rare thing for most programs to set up their students to have the best future possible and give them advantages in the classroom that others simply do not have. Dore said that is why the program is so competitive and includes a lengthy interview process to get the best students possible.